Ghost gossip and murder myths led me to investigate the oldest domestic building surviving in Brighton and Hove. Hangleton was known as Hangetone in the Domesday Book which comes from the Anglo-Saxon “Hangra-tun” meaning “farmstead by the sloping wood”. A population of 200-250 was recorded in 1086 which had dropped to 2 by 1428 after the Black Death. Back in 1967, one of my Regency Society colleagues described this Grade II* Listed Building as, “Not only the most distinguished secular building in Hove, but probably in the whole Brighton area, with the exception of the Royal Pavilion”. It was built in 1540-50, probably for Richard Bellingham, who had acquired the Lordship of the Manor in 1538. 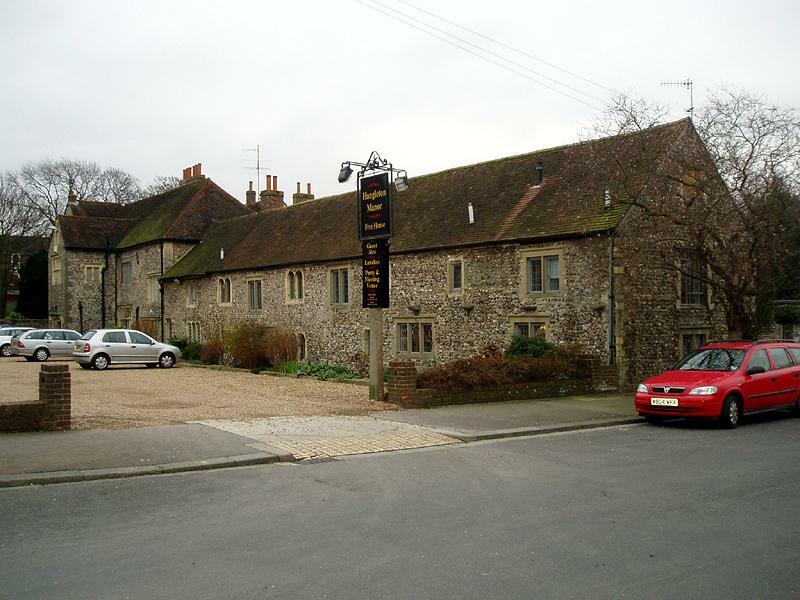 For the next five centuries, the only inhabitants of the area were the occupiers of the manor houses of Hangleton and Benfield and the population had only returned to 100 by 1911. An earlier medieval manor has eerily vanished without trace. The principle features of this flint pile are 16th century panelling and floor tiles, Jacobean fireplaces and a heraldic Tudor ceiling. The nearby dovecote will get a future column of its own. The families of Bellingham, Pollard, Middleton, Norton and Hardwick all lived there at some point and various roads around Hove have been named in their honour. It closed as a hotel in 1965 after surrounding farm buildings were demolished to make way for housing. After years of dereliction it was sold and turned into a public house. Jenny Saunders, the owner since 1982, won’t admit to having seen the resident ghost. However, some of the pub regulars assure me that they sometimes see things after a few pints!